It doesn’t take much snow in Virginia Beach to close the city. A couple of recent snow days allowed us to leisurely peruse cook books, our own library of recipes and of course, cooking blogs. 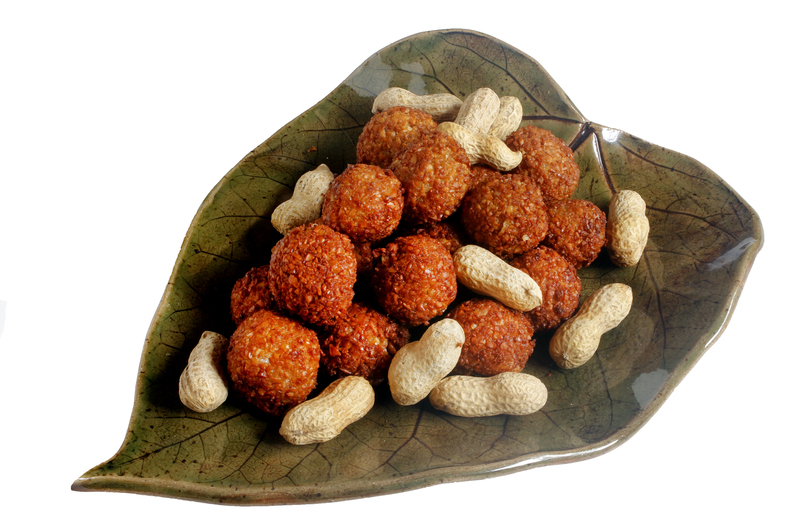 We were quite intrigued when we stumbled on a recipe for something called Kuli-Kuli (fried peanut balls) that seemed to pose a challenge to some in the online cooking community. Allow me to digress for a minute. During my first visit to Colonial Williamsburg many years ago I had lunch at the King’s Arms Tavern. My friend Fran enthusiastically encouraged me to order their peanut soup. One spoonful of this creamy peanut soup had me hooked. I set out to cook more dishes that showcased peanuts. Of course Virginia is famous for peanut growing and the local Suffolk Peanut Festival celebrates this famous legume. Beyond peanuts in Virginia I discovered that peanuts are used throughout African cuisine. I will say that Oli and I have made our share of African peanut stews and I have a great recipe for African chicken/peanut soup, but Kuli-Kuli was something different. This sounded like it would be a great snow day snack. The troublesome recipe in question is quite simple: dry roasted peanuts, onions and cayenne processed into a paste, then formed into little balls and deep fried. The challenge, as we saw it, was to keep these little guys from falling apart during the cooking process. Snowed in with a supply of Virginia peanuts we challenged ourselves to the task. After a couple of tries here’s what we discovered. You have to work very slowly and meticulously. The tricky part is getting the paste to the right consistency. Maintaining the correct oil temperature throughout the cooking process is crucial. Our afternoon in the kitchen produced kuli-kuli with a crunchy golden exterior that encased a spicy, soft, almost hush puppy-like peanutty interior. Ahh the wonderful things that can happen in the kitchen when it snows! 1. Place peanuts in bowl of a food processor and process to a powder. Do not form a paste. Transfer to a bowl and reserve. 2. 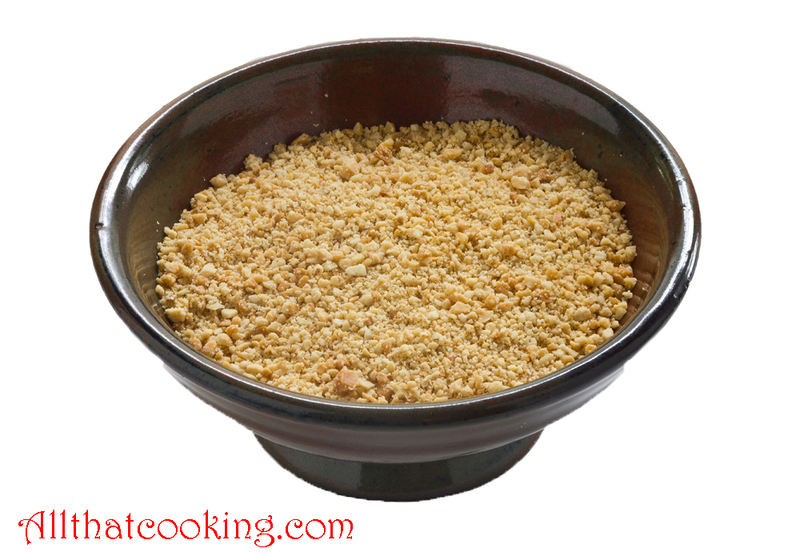 Place onions in same bowl of food processor and process until almost pureed. You should have finely chopped onions in their own juice. Do not process to mush. 3. Add peanut powder to onions, season with cayenne and process until paste is formed. 4. Scoop out a heaping tablespoon of paste and use your hands to form into one-inch diameter balls. Place balls on cookie sheet lined with waxed paper. 5. Heat 3-4 inches of oil in a large pot over high heat until it reaches 350 degrees F.
6. 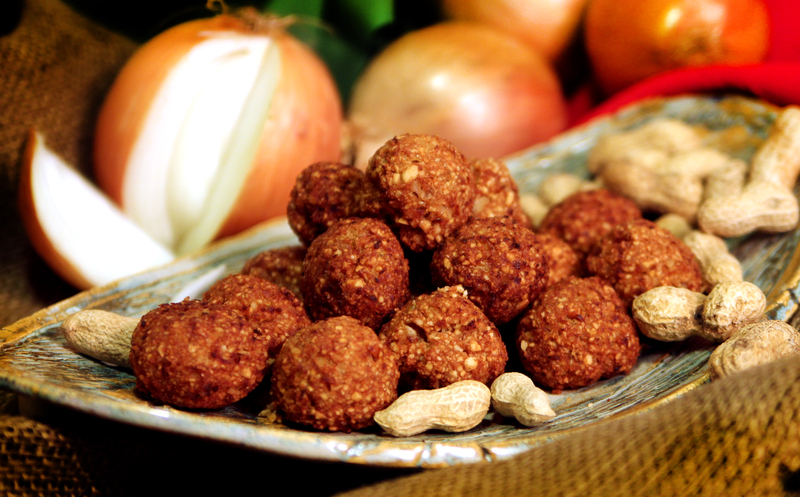 Use a slotted spoon or wire ladle to ease several peanut balls into oil. Do not over crowd. Fry for several minutes until crisp and golden brown. 7. Carefully scoop from oil and place on paper towel lined cookie sheets to drain. 7. Continue frying several at a time until all are cooked. Gallery | This entry was posted in Snacks and tagged kuli-kuli, snack food, Virginia peanuts. Bookmark the permalink. A very unique snack recipe! Bet you can’t stop just eating one or two or ten. I might have finished the whole batch by myself. Gobbled these babies up as they came out of the pot! Yup We were snowed in too. I was a slug though bing watched Netlficks. I do however wish I had your Kuli-Kuli. It sounds scrumptious! Love a snow day challenge. These would make great movie munchies. Snowing in Virginia ? The “Snow Day Challenge” is a challenge for me here in wintry Reykjavik. Your recipe sounds wonderful. I’m looking forward to trying your recipe. when i tried to make it also meltedin the oil.how can i get it right. That’s the challenge this recipe presents. We found that using dry roasted peanuts makes a difference. When you make the peanut balls, they shouldn’t be very wet. Don’t process the onion so much that it turns to liquid. The crucial factor is the temperature of the oil. Clip a thermometer to the side of your pot and maintain the oil temperature at 350 degrees. Only cook a few peanut balls at a time. (Too many in the oil will lower the temperature and cause them to fall apart). If the oil temperature starts to drop, wait until it reaches 350 again before gently lowering a few kuli kuli into the pot. Patience is the key. It took us several tries before we found the right combo. . . . and it was totally worth it!